OK, now what does this lady look like again? 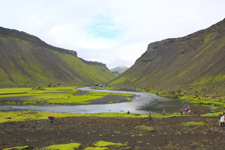 A group of people touring the Eldgja Canyon in Iceland thought that one of their members was missing because she had gone to freshen up and changed her clothes before she returned. The tour guide organized a search party, which she joined. The search was called off at 3 a.m. when she realized that it was her that everyone was looking for. Look, Fritzie, that car is just like ours! A German family left their car with a parking service at Dusseldorf International Airport while they went on vacation. When they returned, they discovered that the parking service had been using their vehicle as part of their limo service after they saw their car pull up and shuttle other people from the airport. The car was driven about 250 miles while they were gone. The University of Massachusetts has again welcomed students back to campus with a world record-breaking culinary treat. A year after starting the semester with a two-ton stir fry, staff and students at the Amherst campus yesterday made and chowed down on a nearly 6,700-pound seafood stew. 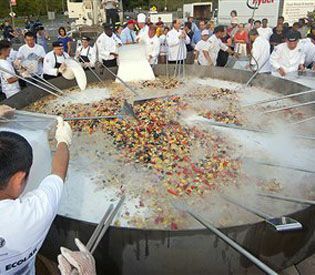 The stew was prepared in the same custom-built, 14-foot pan used to make the stir fry last year. The stew included 1,000 pounds of mussels, lobster, clams, haddock and salmon from sustainable sources in New England and Alaska. It also contained 1,725 pounds of half and half, 1,137 pounds of potatoes, 575 pounds of onions and 145 pounds of bacon, among other ingredients. Last week Russian President Vladimir Putin took to the skies in a motorized hang-glider to help guide a number of Siberian white cranes south for the Winter. If you think that sounds ridiculous, you’re not alone. For Putin, however, its just one of a series of strange, wildlife-related stunts we’ve seen over the years (the very next day, Putin played with an octopus). In Russia the crane-flying stunt attracted a lot of attention – many observers noting that few of the cranes actually followed Putin, an apt-metaphor for opposition jokes. Putin has become alternately notorious and beloved for an array of macho stunts, including posing with a tiger cub and riding a horse bare-chested. Some of the stunts, such as petting a polar bear tranquilized in the wild, have purported scientific connections. But Putin last year was caught short when one of the events was revealed to be a set-up. In that case, Putin was shown scuba diving and bringing up fragments of ancient Greek amphorae. But Putin’s press secretary Dmitry Peskov later admitted the artifacts had been planted on the sea floor for Putin to grab.